In a previous blogpost I discussed how the Swiss scholar Conrad Gessner (1516-1565) describes two strange species of fish, which generate spontaneously. Previously I identified these species as the sprat and the Baltic herring. In this blogpost I explore the background of Gessner’s assumptions about the spontaneous generation of fish. This tells us that the author believes these fishes to generate spontaneously, which seems somewhat surprising. 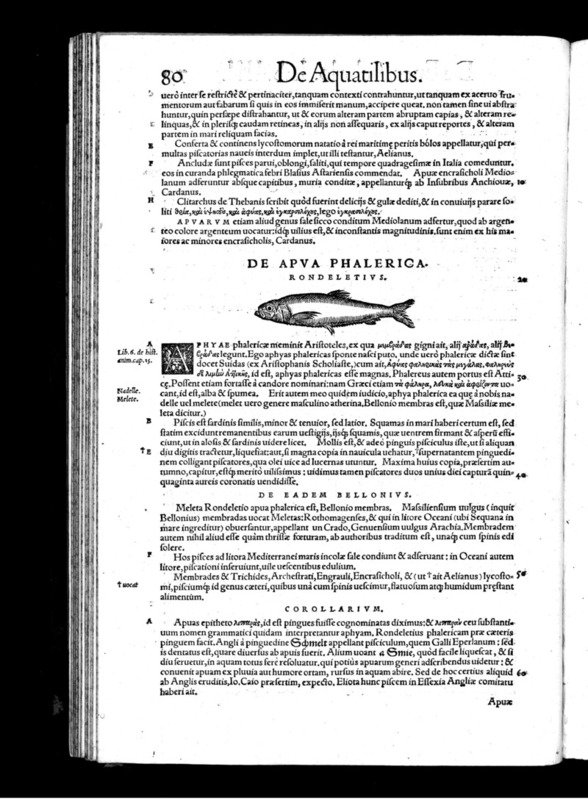 The study of fish was a booming topic in Gessner’s day, from around 1550 renowned scholars produced one publication on fish after the other. All of these experts agreed that fish reproduce sexually. In fact, Gessner described this reproduction process in detail. He makes an exception however, for these two as well as a handful of other species. Why does he do this? Fig. 1 Gessner’s sprat, or aphya phalerica. Historia Piscium. Zurich, Froschauer, 1558. A belief in spontaneous generation, the coming into existence of living beings not from parents but through some other means, originates in the classical era and was still widely accepted within the scholarly community in the sixteenth century. Small creatures, such as for example insects, were thought to generate spontaneously. Some base material was needed for this, often dirt, mud, or decaying matter. From this material a living creature would form spontaneously. As Gessner indicates in his descriptions, we can trace such ideas back to Aristotle’s History of Animals. Aristotle combined information obtained from a variety of sources, resulting in an overview of ideas commonly accepted in the classical era. One such idea was spontaneous generation. While, like Gessner, Aristotle acknowledges that most fish reproduce sexually, he believed that some were the result of spontaneous generation. Aristotle’s ideas were absorbed into Mediaeval, and later into Renaissance science. The idea that animals sometimes generated spontaneously remained more or less unchallenged, and often even seemed to be confirmed by experience. For example, a century after Gessner published his work, the Dutch artist Johannes Goedaert (1617-1668) left out a cup of his own urine and watched it over a period of time. Eventually flies emerged from the cup and, not having noticed the fly that must have laid its eggs near this rich source of nutrients, he took this to prove spontaneous generation. Goedaert would later change his mind but for a while found this experiment quite convincing. Similarly, a little before Goedaert conducted his experiment, Jan Baptist van Helmont (1580-1644) felt confident to provide the following recipe for mice: Place a dirty shirt or some rags in an open pot or barrel containing a few grains of wheat or some wheat bran, and in 21 days, mice will appear. Fig. 3 Where there is grain, there are mice. A Video (17/ 6/ 2016), Little mouse in barrel with wheat. Retrieved from youtube.com. This illustrates perfectly why the concept of spontaneous generation proved so durable, our own observations often seem to confirm it. We can conclude from Aristotle’s History of Animals that the same sort of confusing experience appeared to confirm the concept in antiquity. Aristotle backs up his claim that certain fish can generate spontaneously by citing observations that others have shared with him. Fig. 3. Fishing in the mud. Tim Bunn (22/5/2008), Mud Fishing in India. Retrieved from youtube.com. Aristotle imagined the spontaneous generation of such fish as a sort of chain. According to him, while very small fishes generate from foam that floats on the sea, larger fishes generate from the remains of the deceased smaller fish. A list is provided. When the aphya phalerica dies, the membras generates from its decaying matter, when the membras dies the trichis generates from its remains, followed in due course by the trichias. As we can see, Gessner’s membras and aphya phalerica are mentioned here. This also explains why Gessner describes the former as springing from the latter. The aphya phalerica is the first stage in this chain of spontaneously generating fishes. In Gessner’s day, Aristotle, as the founding father of natural history, was considered a much esteemed source of information. For this reason, Gessner and his contemporaries heavily relied on the information provided by him. Is this then a full explanation why Gessner believes these two fishes to generate spontaneously? It seems that Gessner was familiar with current catch records and market prices of the sprat, suggesting he had an informant who may have observed these species first hand. Surely someone like this, well-informed and possibly in possession of first-hand information, would know that the sprat springs from sexual generation as all other fishes do? Consequently, just because you have observed that a species sometimes comes from sexual generation, this does not mean they cannot also come from spontaneous generation. It really is quite hard to argue with that. Is this all that is to be said on the aphya phalerica and the membras? Not quite. Closer inspection reveals that Gessner and Aristotle are not describing the same species. Where to Gessner an aphya phalerica is a sprat and a membras is a Baltic herring, to Aristotle the aphya phalerica was the anchovies and the membras something undefined, a large anchovies or another small fish. In a future blogpost we will explore this linguistic confusion. Conrad Gessner, Historia Piscium. Zürich, Froschauer, 1558. Sophia Hendrikx, Identification of herring species in Conrad Gessner’s ichthyological works, a case study on taxonomy, nomenclature, and animal depiction in the sixteenth century. In: Paul J. Smith and Karl A.E. Enenkel (Eds. ), Zoology in Early Modern Culture. Intersections of Science, Theology, Philology and Political and Religious Education. Leiden, Brill, 2014. This post also appeared on the Leiden Arts in Society Blog. © Sophia Hendrikx and Fishtories, 2017. Unauthorised use and/or duplication of this material without express and written permission from this site’s author and/or owner is strictly prohibited. Excerpts and links may be used, provided that full and clear credit is given to Sophia Hendrikx and Fishtories with appropriate and specific direction to the original content. In 1553 the French naturalist Pierre Belon published, in his book on aquatic animals De Aquatilibus, the here shown depiction of what at first glance appears to be a frightening sea-monster. Belon’s discussion of this animal is serious and detailed. This animal catches it’s prey by leaping up from the water, he writes, and he advises his readers not to eat it. It has a foul taste and smell, he explains, and can upset the stomach. Pierre Belon. De aquatilibus. Paris, Charles Estienne, 1553. Library of the United States Department of Agriculture, Cambridge (Mass.). What Belon fails to mention, and most likely did not know, is that this animal is in fact a European eagle ray which has been cut and twisted before being dried, in order to make it look like a monster. The distorted snout and twisted body are sure sights of human interference, and in fact such distorted rays were created on a large scale across Europe at this time. In the sixteenth century monsters were very much ‘in fashion’, and this widespread interest made it a lucrative business to create objects that could reasonably pass as monstrous creatures. Gessner admits that he also initially did not know the animal was a fake. The depiction was sent to him by an apothecary, who did not disclose this. Eventually however, he figured it out, and he strongly disapproved of the practice. He explains that he discloses how these creatures are made in order to warn his readers about these fakes, and about the fraudulent people who exhibit them and charge others money to see them. This needs to be explained, he writes, as “ordinary people are very much impressed with these things”. Rays and skates are in fact extremely suitable to make creations such as these. These fish already have a suggestive appearance, their underside looks to us as if we see a semi-human face, the nostrils looking like a pair of eyes. In addition, they can be easily manipulated, by curling the side fins over the back, twisting the tail into strange positions, and using string tied behind the head to create a neck. Finally, rays and skates can be easily dried in the sun, and shrink when this is done, resulting in an even more twisted and monstrous appearance. In 1613 Gessner’s acquaintance and correspondent Ulysse Aldrovandi published a range of depictions of such monstrous dried rays, or jenny hanivers as they are nowadays called, in his De piscibus. The origin of the term jenny haniver may lie in the French phrase jeune d’Anvers, Antwerp having been a centre of production for these things. An ardent collector of all sorts of naturalia Aldrovandi may well have seen and handled all the jenny hanivers he included in his book. It is known he owned several of them. The here shown depictions shows one which resembles a flying dragon which looks like it is mid-flight. Much like Gessner, Aldrovandi clearly indicates that such creatures are not real. Ulysse Aldrovandi. De piscibus. Bologna, Baptiste Bellagamba, 1613. Université Louis Pasteur from University of Strasbourg. So does this mean that once the word was out naturalists were more sceptical about reports they received about strange creatures from the sea? Perhaps that is an overstatement. In spite of his critical description of the above shown specimen, Gessner also shows Belon’s jenny haniver in his Historiae Animalium and copies Belon’s description of it almost word for word, without any of the criticism voiced in his description of the other jenny haniver. One possible explanation for this is that it mattered to Gessner whether or not information came from what he perceived as a reliable source. An esteemed naturalist such as Pierre Belon was certainly that. On top of this, just because something seems unlikely does not necessarily mean it isn’t true. As Gessner writes referring to other monstrous creatures, such as the sea-monk and the sea-satyr: some creatures have been reported either so often or by such reliable sources that he cannot exclude the possibility that they exist. Pierre Belon. De aquatilibus. Paris, Charles Estienne, 1553. Conrad Gesner. Historiae animalium liber IIII. Zurich, Christoph Froschauer, 1558. Ulysse Aldrovandi. De piscibus. Bologna, Baptiste Bellagamba, 1613. Sophia Hendrikx. Het eerste en misschien ook wel het kleinste en mooiste boek over waterdieren. In: Hans Mulder en Erik Zevenhuizen (Red. ), De natuur op papier. 175 jaar Artis Bibliotheek. Amsterdam, Athenaeum-Polak & Van Gennep, 2013. Peter Dance. Animal frauds and fakes. Maidenhead, Berkshire, Sampson Low, 1976. © Sophia Hendrikx and Fishtories, 2016. Unauthorised use and/or duplication of this material without express and written permission from this site’s author and/or owner is strictly prohibited. Excerpts and links may be used, provided that full and clear credit is given to Sophia Hendrikx and Fishtories with appropriate and specific direction to the original content. This blogpost also appeared on The Leiden Arts and Society Blog. In January when the farmers thresh their wheat. 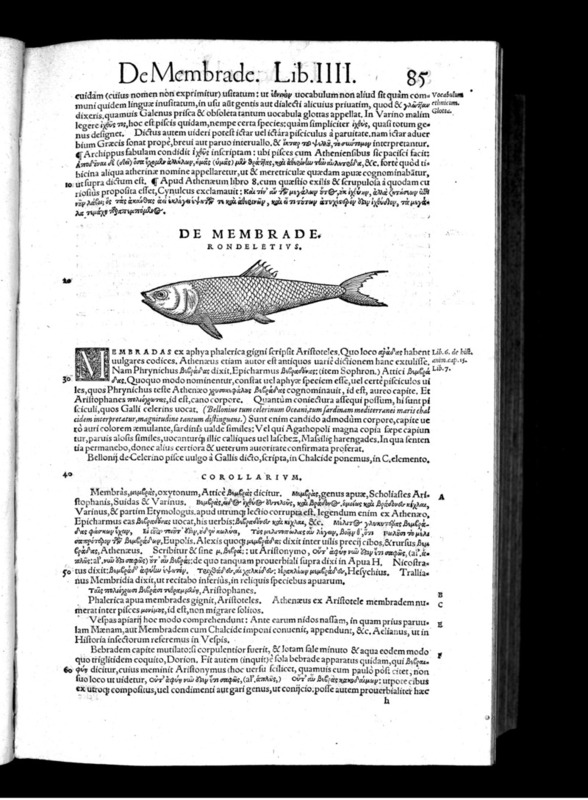 This is a page from a 1557 book on fishes from Lake Constance by fish fanatic Gregor Mangolt. A former priest turned protestant, Mangolt had to flee his native Germany and ended up in Switzerland, where he met and befriended the scholar Conrad Gessner, who like Mangolt happened to be fascinated with fish. This turned out to be fruitful encounter. A few years earlier Gessner had published a calendar together with the local physician and all round celebrated literary, political and medical writer Jakob Ruf. Gessner supplied the images while Ruf supplied the text. Each month of the year was illustrated with a depiction of two local fishes and a short poem. The poems dispense advice on eating fish, reasoning from a medical perspective. At the time the dominant medical theory was humouralism. This states that people’s personalities and their physical condition depend on the presence of four different fluids in their body: yellow bile, black bile, blood, and phlegm. If one of these is present in excess, body and mind are out of balance. The balance can be restored (or disturbed even more!) by the consumption of certain foods. Since fish live in water they are, as the poem states, cold and wet. These are qualities that increase the amount of phlegm in the body. The eating of fish was consequently tricky business. An excess of phlegm made a person phlegmatic, a condition that was best avoided. On the other hand, if a person had an excess of certain other fluids but a lack of phlegm, eating fish could restore balance. It could change aggressive personalities and people who tended to drink and eat to excess into more moderate people. In order to decide what you should eat, you should therefore first consider who you were. In order to make sure the right people ate fish, and others did not, the calendar provides playful instructions through the included poems. When Gessner read Mangolt’s book of fish, which provides descriptions of a range of local species, he felt this would go well with his fish calendar. Mangolt did not provide illustrations and his text is rather dry, the addition of Gessner’s calendar certainly made it more lively. On the other hand, Gessner’s calendar provided little serious information and Mangolt’s text could provide a welcome balance. There was only one problem, Mangolt did not want his fish book published. This however did not deter Gessner. He asked to borrow the manuscript and took it to his cousin, Andreas Gessner, who was a printer. The Gessner cousins then proceeded to mix the calendar and Mangolt’s text to create a joint publication. The above image is one of the first pages of the end result. When the book was printed the Gessners listed Mangolt as the sole author on the title page. We can only guess how Mangolt felt about this. However we do know that the book was reprinted at least twice, it appears therefore that he put his reservations about publishing his work aside. Keller, Hildegard Elisabeth: Edition, Einleitung und Kommentar der Fischsprüche. In: Keller, Hildegard Elisabeth (Hg. ): Jakob Ruf. Leben, Werk und Studien, Zürich 2008 (Jakob Ruf, Leben, Werk Studien Vierter Band), S. 967-993. Culinary fish-poetry: Francois Boussuet, De Natura Aquatilium Carmen, 1558. When the spring comes, they will be suitable for the gullet. This dish is free from harmful bones. Only a fool rejects them. I will prefer them to all others. But mackerel will always be a friend to me. In his 1558 De natura aquatilium carmen Bousuet reproduced all the excellent woodcuts from Guillaume Rondelet’s Libri de Piscibus Marinis, including the sea monk and the sea bishop. Rather than Rondelet’s descriptions of the various species, elegant poems on the culinary, and in some cases medicinal, value of fish were added to the depictions. The above image is taken from the fourth volume of Joachim Camerarius the Younger’s emblem book Symbolorum et Emblematum, published in 1604. The story behind the depicted scene goes back to Pliny’s Natural History, which states that parrot fishes help their friends escape from wicker-basket traps by pulling them out by their tails. As a result, parrot fish came to be known as a symbol of friendship. In fact, this is a gross misinterpretation. In regions where wicker-basket traps are still used to catch these fish, the species is known for violently attacking specimens of their kind who have gotten stuck between the twigs of the traps. This post is based on a conference paper I presented at the Emblems and the Natural World conference, Münster (Germany), December 17-18, 2015.